Looking for some fun around Sebago Lake that doesn’t include boating and fishing? There are plenty of other attractions to keep your family entertained all year round. 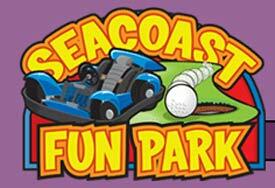 Seacoast Fun Parks has a broad collection of attractions ranging from the adrenaline-filled Sky Swing to a more relaxed game of mini-golf, we have something for everyone. Whether you’re looking to add a little excitement to your life, or you just want to spend a relaxing day in the great outdoors, come on over to Seacoast Fun Park. We do not have any admission fee or gate entrance fee. You may come in and pay for just the attraction that you wish to participate in, or just watch your family play. Grandparents can walk around the mini-golf course and keep score for their Grandchildren; Parents can watch or take pictures of their kids Go-Karting from our deck. If your kids are not tall enough to drive our Go-Karts, then you can drive them for only $1.00 more. There is no additional charge to drive your kids on the Bumper Boats. We are an 18 hole public golf course with a full service pro shop and driving range. Our public restaurant serves breakfast, lunch and dinner. Please check our site for hours of operation as we are a seasonal business. Hailed as one of the finest golf courses in Maine, Point Sebago’s 18-hole Championship course offers a fantastic day of golf. Situated on 500 acres of spectacular white birch forest, the par 72 course caters to all levels of play. Course length ranges from a challenging 7,002 yards from the back tee to a forgiving 3,200 yards from the forward tee. Golf clinics and golf schools with our USGTF professionals and our extensive practice center will noticeably improve your skill and appreciation of the game. The Point Sebago course delivers the best golfing experience possible… round after round. Blacksmith’s Winery is located in South Casco, Maine and offers visitors a full offering of great wines including Merlot, Cabernet and Syrah. They also have their award winning Vidal Blanc and local favorites like Blueberry and Elderberry. With tastings every day in the summer, Blacksmith’s is worth the visit. Steamboat Landing is Maine’s premier miniature golf course. We are located in a shaded, woodland setting. A trip to Steamboat Landing is like taking a tour through the Pine Tree State and experiencing “…the way life should be.” This challenging course is based on the history of the area and includes many landmarks from around Maine. Our course is challenging, yet offers a fun experience for even our youngest visitors. Families will find our course a good spot for a “family competition,” or simply a leisurely stroll around the course as our trees provide relief from summer’s heat. 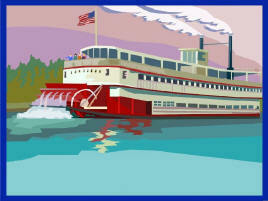 The SONGO RIVER QUEEN II is a privately built replica of the famed Mississippi River Paddle Wheelers. The QUEEN is 93 feet long, 23 feet wide, and tips the scales at 100 tons, enabling it to offer an exceptionally smooth ride for even the most timid of passengers. Built in 1982, the QUEEN is meticulously cleaned and maintained to the highest of standards. She is rated for up to 350 passengers and is handicapped accessible. The QUEEN has two decks including an open upper deck with an attractive red striped canopy for protection from the sun and rain, as well as a fully enclosed and heated lower deck, and there are restrooms on board.